Color Alert® MAXIMIZE, extends our monthly single color validations of our Forecasts in combination with other colors seen in the market. 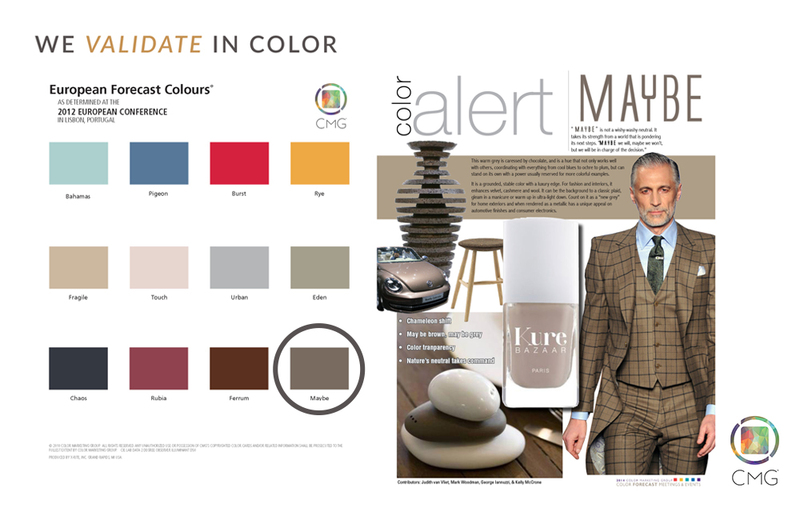 Every year Color Marketing Group (CMG) announces the World Color Forecast™ during our November International Summit. This is the culmination of a year’s worth of research, conversations, and collaboration by CMG members on the future of color directions. Sandy Sampson, CMG VP PR & Communications. The Forecast contains sixty-four colors that industries will use two years from now. Some industries have a longer product to market cycle than others. This time to market changes with new technology introductions. From these 64 colors, we select 12 of the colors that are the strongest candidates to reach multiple markets and highlight them in the monthly Color Alert® program. Forecasting colors is an amazing visual and written process. Development of the drivers’ and influencers’ of the color story takes passion and sleuthing. From there the Color Alert® colors move to validation. These colors appear as products two years following the announcement of the World Color Forecast™ and are highlighted. 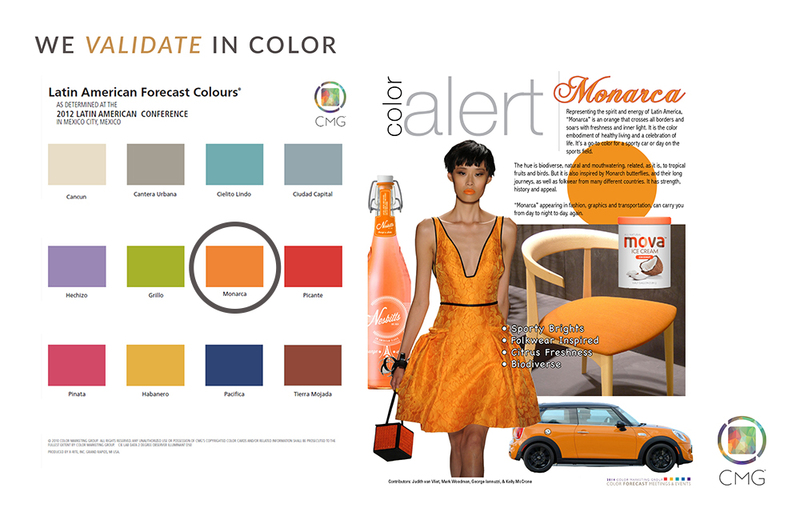 A few years ago, CMG started validating and sharing the World Color Forecast™ through Color Alerts. Today it is a valuable tool for color design professionals. Members travel the globe searching for innovative ideas, colors, materials, and finishes and this research is the backbone of the program. Colors are not meant to be alone. They like to play in combinations that tell their own color story and elicit powerful responses. Spotted in the market, product colors in our new Color Alert® MAXIMIZE program, validate the color combinations of the month. Look for the new MAXIMIZE in an eBlast and added to the Color Alert® Archive page soon! CMG Color Connection bi-weekly newsletter.